Gareth Brown fired home Institute's all important opening goal against Loughgall. For the second week in a row Institute left it late. Two goals from Gareth Brown and Alex Pomeroy in the closing stages ensured Kevin Deery’s side deservedly defeated Loughgall 2-0. The Drumahoe men huffed and puffed throughout with Michael McCrudden in particular missing a host of clear cut chances in the first half. However their never say die attitude ensured they netted twice in the final five minutes to claim a massive three points, as they kept their promotion hopes alive. Unfortunately one sour note from the match emerged after the game, as Stute defender Sean Roddy had to be taken to hospital with what looked like a serious knee injury. 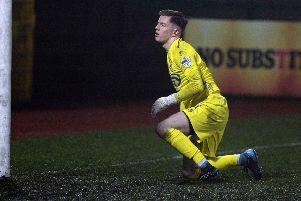 The home side had a half chance on three minutes, but McCrudden’s deflected effort, which had goalkeeper Gareth Buchanan beaten, was cleared off the line by defender Paul Stretton. Loughgall went close themselves on 22 minutes but after a super first touch Daniel Ryan’s strike, from the right hand side of the box, was kept out by Stute goalkeeper Marty Gallagher. A minute later a clever piece of play by McCrudden and Brown ended with the Gobnascale man failing to keep his shot down, from just inside the box, on target. The Villagers had a good opportunity on 30 minutes but Steven Ferguson blasted over, after Ryan’s cut-back had picked him out on the penalty spot. McCrudden should have given Stute the lead two minutes later when good refereeing by Stephen Wallace allowed play to continue, as Ciaron Harkin was fouled but the referee waved play on, his ball created the chance, but ex-Ballinamallard United man was denied by Buchanan. Moments later Brown’s left wing centre found McCrudden, who saw his downard header from six yards was easily saved by Buchanan. The striker from a tight angle nut-megged Buchanan, after being quickest to react inside the six yard, as visitors failed to clear their lines. Within a minute youngster Pomeroy doubled their advantage when fellow subtitute Stephen Mills fed the teenager, who showed super composure to chip the ball over the out-rushing Buchanan. Pomeroy’s goal just like Brown’s equaliser at Lurgan Celtic last week, sparked wild celebrations amongst the Stute supporters. Institute: Gallagher, Roddy, O’Donnell, Scotlock, Hume; McIntyre (Dunne 60), C Harkin, A Harkin (Pomeroy 71), McCrudden (Mills 71); Brown, Grace. Loughgall: Buchanan, Taylor, Stretton, Copeland, Hudson, Walsh, Ferguson, Henderson, Mullan, Ryan, Rea. Referee: Mr Stephen Wallace (Londonderry).